Cool #Sackville Owned Biz: “The Lush Brush” Painting Parties! | Sack-Vegas!!!! 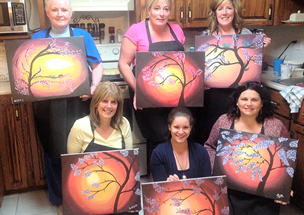 Cool #Sackville Owned Biz: “The Lush Brush” Painting Parties! “Looking for an alternative for your usual “girl’s night out”? How about a bachelorette party or your child’s birthday party? The Lush Brush will create a private party in your home or workplace, as well as public venues. No artistic ability? No problem! Our artists will guide you step by step through the process in an energetic, party atmosphere. You bring the wine, we bring the fun and everything else you need to create a one of a kind, ready to hang, piece of art that YOU created! Posted by Sacky on June 24, 2014 in Welcome To Sackville!.